Socrates’ maxim “know thyself” challenges us to attain self-knowledge before knowing anything else. In the last century, a powerful and dynamic tool has been rediscovered. This tool, the Enneagram, is like a map or compass to our inner selves. It helps us more deeply understand and appreciate our strengths, limitations and core motivations. 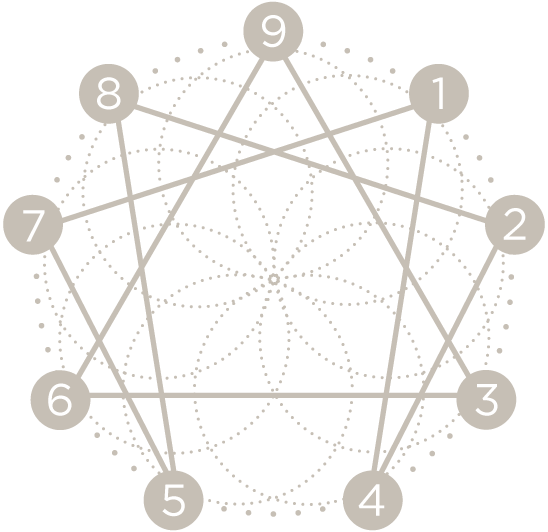 The word Enneagram means “a drawing of nine.” The ancient symbol has been used throughout history to represent fundamental universal laws – expressed mathematically – to mirror patterns in our world. One of these patterns is human personality. Your Enneagram Type is your filter, bias or preference through which you experience the world. Your dominant Type was created very early in your life and doesn’t change. It’s a combination of nature and nurture — what we bring with us into the world (our temperament), and who and what we meet and experience in our early years. Why does your Enneagram Type matter? Over the years, our dominant Type patterns become ingrained and very limiting. Most of us react from these patterns rather than by thoughtfully responding to situations and people. These narrow, habituated patterns of our dominant Type show up everywhere: home, work, social settings. That means the same patterns that earned you a promotion may have cost your marriage. Because Type is so strong, it’s hard to see where these habits help and hinder us. Some aspects that seem like liabilities are simply strengths that we over-use. When you know these patterns and learn how to interpret them, you can experience long-term, sustainable personal and professional growth. You understand, accept and manage yourself better – and are better able to work with diverse groups of people. The Enneagram is a brilliant tool to increase your emotional intelligence. Many kinds of personality assessments measure behavior. They describe our preferred ways of doing things. Trying to change a behavior by focusing on the behavior often yields short-term results. That’s why diets don’t keep extra weight off in the long run. The Enneagram is different because your Type isn’t determined by your behavior, but by your hidden motivation. It isn’t about what you do but why you do it. If you want to make a lasting change, you must focus on the deeper motivation behind your behavior. That is where real change happens. The Enneagram offers a fresh lens that complements the Myers-Briggs Type Indicator® (MBTI®), DiSC® or other systems. To make lasting changes in our lives, we must determine what currently shapes our judgment and decisions. We must uncover the dynamics of Type. Ones seek a perfect world and work diligently to improve both themselves and everyone and everything around them. Learn more about Type 1. Twos want to be liked, try to meet the needs of others, and attempt to orchestrate the people and events in their lives. Learn more about Type 2. Threes organize their lives to achieve specific goals and to appear successful in order to gain the respect and admiration of others. Learn more about Type 3. Fours desire deep connections both with self and others, and they feel most alive when they authentically express their feelings. Learn more about Type 4. Fives thirst for information and knowledge and use emotional detachment as a way of keeping involvement with others at a minimum. Learn more about Type 5. Sixes have insightful minds, are prone to worry, and create anticipatory scenarios to feel prepared in case something goes wrong. Learn more about Type 6. Sevens crave stimulation (ideas, people, and experiences), avoid pain, and create elaborate future plans to keep all their options open. Learn more about Type 7. Eights pursue the truth, like to keep situations under their control, want to make important things happen, and try to hide their vulnerability. Learn more about Type 8. Nines seek peace, harmony, and positive mutual regard, and dislike conflict, tension, and ill will. Learn more about Type 9.